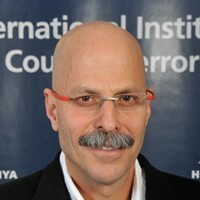 Yaron recently retired from a long career in the Israel Security Agency ("Shabak"), where he served since 1982, at the core of the intelligence and operations hub of the organization, in numerous top management and command positions, at the field sectors as well as in the organization HQ. For seven years, Yaron served as the head of the flight security unit of El-Al and the other Israeli flight carriers, in Munich, Rome, and Paris. He gained vast and varied experience in management and command over major independent units, operating in unique and challenging conditions, initiating special and complicated operations, collaborating with other branches, organizations and intelligence communities, in Israel and abroad. Between 2006-2011 he was the head of a designated department in the Israel Security Agency HQ (parallel to the rank of Colonel in the IDF). In this position he was also a member of the small negotiations team, working to free from captivity the abducted Israeli soldier, Gilad Shalit. Between 2011-2013 Yaron was the CEO of Atid Technological Colleges Network.